Sandro Homme is getting arty! 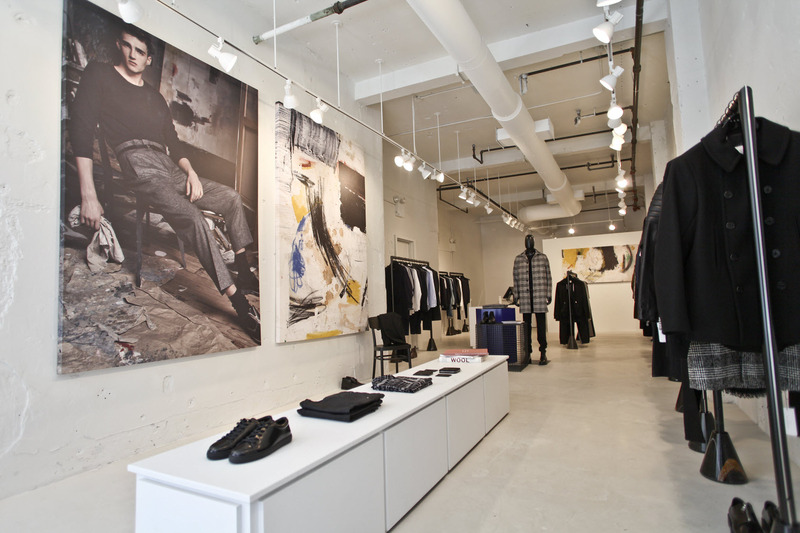 The brand opened its first menswear store in the U.S. this month at 145 Spring Street across from its women’s store and they’ve created a temporary in-store residence for artists to mark the occasion. Dubbed “The Workshop”, the 880-square-foot store will feature live installations from different contemporary artists each month through the end of the year. Each artist will have a week to use The Workshop as their own studio and produce live art in front of retail customers. After their week in-store, the artist’s work will be on display for the rest of the month until the next artist sets up shop. Everything, from the walls, to the floor, to the furniture, will serve as a blank canvas for each artist. First up? Virginia-born, New York-based artist An Hoang, whose previous exhibitions include Halsey McKay Gallery, Susan Inglett Gallery, The Last Brucennial, Ballast Projects, and KiddYellin. “My work is referencing landscape and urban landscape, but it’s mostly abstract,” said Hoang. In October, Joseph Hart will be the artist in residence followed by a yet to be disclosed artist in November. Sandro’s creative director, Ilan Chetrite, said the idea came together last month. “I just gave a list of artists I like and that inspire me,” said Chetrite. “It is good for them to express themselves and express their art. For us it gives relief to our clothes.” Chetrite, who is an art collector himself, said that he may eventually do a collection of T-shirts based off the artists’ designs. Stay tuned! In the meantime, head over to the store to peruse the chic minimalist clothes and the art.